A integral seat option as well as a removable hard-faced seat ring can be easily rotated or replaced, reducing time spent on maintenance. To withstand abrasion or corrosion, Hilton Coal Burner Isolation Valves feature valve bodies and gates of carbon steel or 304 stainless steel. Other options include a stainless steel rising or non-rising stem. A bronze yoke sleeve provides easy actuation and additional resistance to corrosion and wear. Available in sizes from six to 24 inches (150 to 600mm), Hilton Coal Burner Isolation Valves can be equipped with manual or powered actuators, including handwheel, chainwheel, pneumatic cylinder or electric motor. 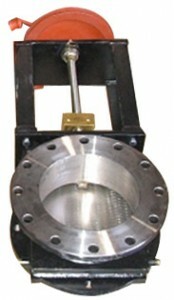 Flange options include ANSI 125/150, NFPA 85F 1988, or Babcock & Wilcox.